JVC has announced a new, expanded line of home theater projectors that offers significant improvements in picture performance and upgraded e-shift technology, which upconverts and scales 2D content to a 4K signal. Now called e-shift2, the technology is available in three new JVC projectors. Other performance-enhancing features include a new illumination system and a new polarizing wire grid in combination with e-shift2 for higher native contrast. 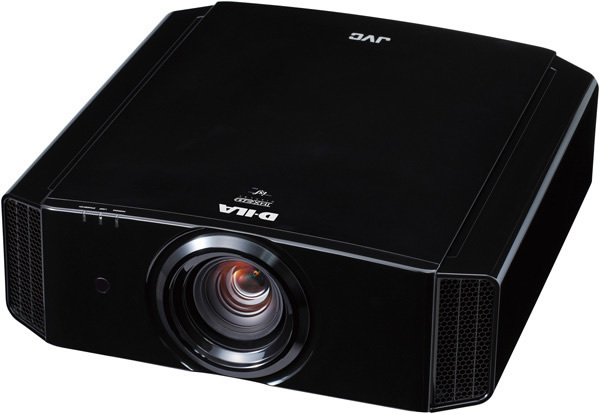 JVC’s 2013 projectors are the DLA-X95R, DLA-X75R, DLA-X55R and DLA-X35. All are 3D-enabled and all except for the basic model offer e-shift2. The DLA-X55R and DLA-X35 are available with a black or white cabinet. Introduced last year on two models, e-shift upconverts and scales 2D HD content to a 4K signal (3840 x 2160) and displays it at full 4K precision. Compared to a Full HD (1920 x 1080) image, that’s twice the horizontal and vertical resolution and four times the number of pixels, or over 8 megapixels. The result is a stunningly detailed image with minimal aliasing artifacts found in standard HD displays. This year’s upgraded e-shift2 technology, available in three models, provides improved 4K performance with higher native contrast in combination with a new polarizing wire grid engine. In other enhancements, new 2K to 4K scaling technology using proprietary JVC algorithms replaces a two-band filter with an eight-band filter to apply more correction to more areas of the image. This delivers a noticeable improvement with any compatible 2D signal. To optimize performance for different content, this Multiple Pixel Control offers five preset modes plus Off. 3D performance has been improved, with new circuitry and a new optical engine responsible for reduced cross talk. The result is more natural, clear and brighter images. Another key enhancement is a new illumination system, including a new lamp and power supply, which delivers a significant improvement in brightness over the life of the lamp. To provide enthusiasts with a true measure of performance, JVC has long focused on native contrast and refused to artificially enhance contrast specifications through the use of a dynamic iris. For 2013, native contrast has been improved in most models through the use of a new polarizing wire grid, ensuring that every frame consistently and faithfully reproduces peak whites and deep blacks. The flagship DLA-X95R offers a 130,000:1 native contrast ratio. The DLA-X75R offers 90,000:1 native contrast, and the DLA-X55R and DLA-X35 offer 50,000:1 native contrast. • New Eco mode in standby that reduces power consumption. The flagship DLA-X95R is built using hand-selected, hand-tested components and provides 1200 lumens brightness and 130,000:1 native contrast ratio. The DLA-X75R provides 1200 lumens and a native contrast of 90,000:1. The DLA-X95R and DLA-X75R feature the e-shift2 upgraded light engine, full color management, ISF certification and advanced calibration functionality. In addition, they are designed to achieve THX® 3D Certification and are scheduled for THX testing. The DLA-X55R brings e-shift2 to a new price point and features JVC’s Color Management System, five lens memory presets, 1300 lumens brightness and a native contrast ratio of 50,000:1. The DLA-X35 is a 3D-enabled projector with 1,300 lumens brightness and a 50,000:1 contrast ratio. The new JVC D-ILA home theater projectors will be available in November 2012. Together with these new projectors, JVC offers new 3D accessories: the PK-AG3 RF 3D glasses and PK-EM2 RF emitter. Both are compatible for all JVC 3D projectors, including previous models. Also available is a new spare lamp, PK-L2312U, specially designed for JVC’s 2013 models. The PK-L2210U lamp for current JVC projectors remains available.